So who doesn't love Superman? Although he's been featured in numerous movies and TV series over the past few decades, most will regard the movies with Christopher Reeve (at least the first two) as the definitive Superman. After the disaster that was 1987's Superman 4 however, the Man of Steel took a break from the big screen until 2006's Superman Returns, where he had just sort of disappeared for a while and decided to come back, and Lex Luthor was still out to get him. 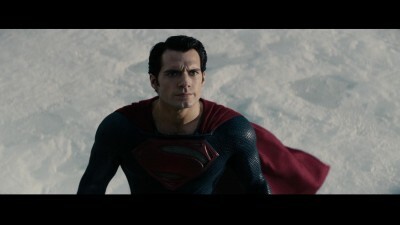 Seven years later, Warner brings us Man of Steel, which can best be described as a re-imagining of the Superman legend. It disregards any previous depictions and starts from scratch, beginning with his birth on his home planet Krypton to father Jor-El (Russell Crowe) and mother Lara Lor-Van (Ayelet Zurer). While the Krypton in 1978's Superman was a world of white crystals, here it's an elaborate planet with flying CG creatures, spaceships and gadgets. One new element is that for the past few centuries, Krypton's inhabitants haven't been born naturally (with the exception of Kal-El)- instead they're grown in an underwater "Genesis Chamber" where each one's function in life is pre-determined. General Zod (Michael Shannon) for example was born to be a fighter- but as before he has ambitions of taking over the planet which doesn't sit well with Krypton's council and they send him and his henchmen into the Phantom Zone. While in the 1978 film that consisted of just a flat plane they were trapped in that flew through space, here they're aboard a spaceship which then gets sucked into a netherworld- at least for a while. While Krypton might be better off without Zod and company, attention soon turns to its imminent self-destruction. While nobody else seems to be making escape plans, Jor-El puts his son into a flying pod so that he'll have a new chance at life on Earth, saying "He'll be like a god to them." The rest of the Kryptonians perish as the planet explodes- which begs the question: Why didn't they just keep General Zod there so that he'd die with the rest of them? From here, the structure jumps around as we first see Kal-El (or Clark Kent, the name given to him by his Earth parents) grown up (played by Henry Cavill) working on a ship and being called "Greenhorn" by his boss. The movie soon flashes back to Clark's younger days (where he's played by Cooper Timberline at age 9 and Dylan Sprayberry at age 13) where we see him first discover his powers. Jonathan (Kevin Costner) and Martha Kent (Diane Lane) have taken him in as their son and know there's something different about him but try to give him a normal life. There's a great scene where Clark is at school and suddenly becomes aware of his ability to see through things and hear every detail, then gets overwhelmed and runs out of class and Martha has to come and comfort him. Later some kids try to pick a fight with him but he just remains motionless, as he could potentially hurt them more than they deserve. The main point here is that by the time Clark grows up, he still doesn't know where he came from and hasn't yet become Superman. The closest he gets as a kid is when his school bus falls to the bottom of a river, and on the spur of the moment he lifts it back to safety, which only one other student on board sees him do but it leads to Jonathan warning him not to flaunt his abilities even to save a life. Lois Lane (Amy Adams), still a reporter for the Daily Planet, comes into the picture when she travels up North to investigate the discovery of a strange object hidden in the mountains. This turns out to be Man of Steel's equivalent of the "Fortress of Solitude" that Jor-El has set up for Clark to find and learn about his past. 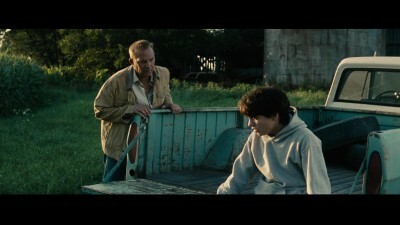 When Clark is drawn to it, Lois sees him and follows him from a distance. A strange robot-like device ends up attacking and wounding her, so Clark tells her "I can do things that other people can't" and heals her with his heat-vision before disappearing. Lois then sets out to find out just who he is. General Zod and his buddies meanwhile have escaped their captivity (again, why weren't they just kept on Krypton as it exploded?) and are searching for a new planet to call home. They arrive on Earth and decide it's perfect. While in Superman II this resulted in the world's governments being taken over and citizens ordered to "kneel before Zod," here it's a lot worse as spacecraft are deployed to the corners of the earth to give the planet a good shake-up, with buildings being sucked up and then left to fall back to the ground, leaving cities in ruins. 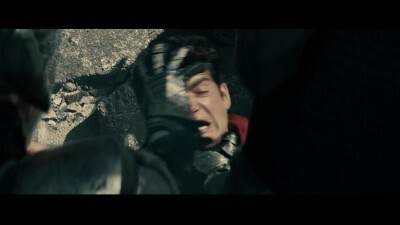 Zod also wants Clark to help him Krypton-ize Earth, but of course he won't have that and sets out to stop him. The most striking thing about Man of Steel is how grim it is compared to the previous Superman entries. 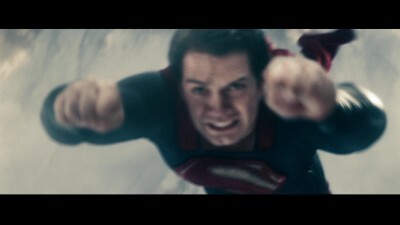 Christopher Reeve's Superman was confident and heroic, but here Henry Cavill's rendition doesn't seem so sure of himself. He can take off flying much faster though, and isn't afraid to throw a few punches. The tights that Christopher Reeve wore have been replaced here by a more menacing chain-mail suit. The movie's general atmosphere is pretty dark, with a blue tint given to the entire movie and a score by Hans Zimmer that is quite a contrast to that of John Williams in the earlier movies. However, it seems like the Superman comic books have recently taken a dark turn as well- I haven't been keeping up with them, but I know Superman was actually killed in one of them not too long ago (but of course eventually brought back to life.) Keeping an open mind while watching Man of Steel, I accepted most of the liberties being taken and enjoyed it for what it was. Shot on 35mm film in a 2.35 ratio, Man of Steel looks as it's intended on Blu-Ray. There's just a slight amount of film grain, and again colors are muted with most of the picture tinted blue- cold is a word that best describes it. The look is very similar to director Zack Snyder's 300. The movie was post-converted into 3D by Legend 3D, and a separate release is available that includes a 3D version in addition to the three discs in this set. A movie this big should have been shot in true 3D, but the conversion should still have potential to look great if it was done right. A standard DVD (coded for regions 1, 3 and 4) is also included which seems to look about as good as standard DVD can, but it's a great reminder of Blu-Ray's increased resolution- there's really no comparison. Audio on the Blu-Ray is in 7.1 DTS-HD Master Audio and is, in a word, loud. This is one of those sound tracks you can feel, with explosions, flying airplanes and spacecraft, and falling buildings. I have to thank my neighbors for not complaining about it either! The standard DVD is in standard Dolby Digital 5.1 and isn't quite as powerful. An interesting selection of foreign languages are included, more than what's indicated on the cover. On the Blu-Ray not only do we get Canadian French and Spanish, but also Portuguese and Chinese, with subtitles in each of these as well (plus of course SDH-style English subs.) The DVD drops the Portuguese and Chinese tracks but adds one in Thai, and includes Thai subtitles in addition to all other languages on the Blu-Ray except Portuguese. The second Blu-Ray presents the movie in a format similar to Warner's previous "In-Movie Experiences," but apparently a bit too fancy to program into the movie disc itself. Here the movie plays in a window most of the time with other windows opening to show us production footage and commentaries from the director, cast and crew. Most of the production footage is in sync with the movie itself, which is interesting to see how things looked before special effects were added (and the color tinted blue.) There's also a tongue-in-cheek featurette on the planet Krypton, done in the style of a PBS show assuming that Krypton is actually a real planet. Man of Steel had quite mixed reactions to its theatrical release, with some enjoying the new take on the Superman legend with others despising it. Overall, it worked quite well for me as a mindless popcorn movie and should serve as good home theater demo material for many. It should be interesting to see if this particular Superman franchise continues.